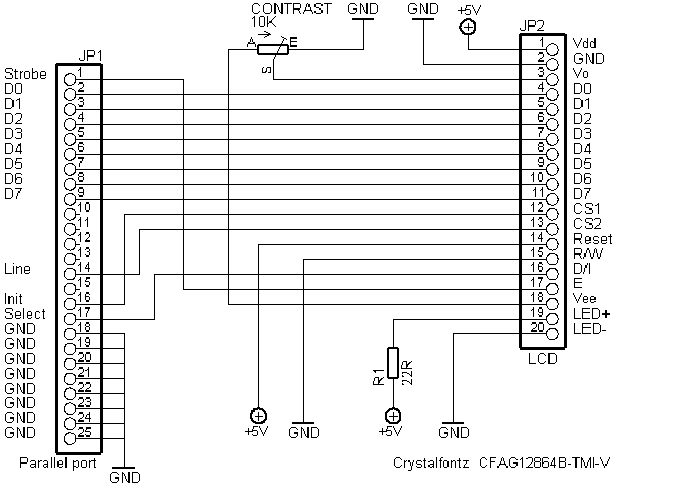 Do you have software that controls parallel port so that i can use CFAG12864B? I used the schematic that you posted. However, LCD info_nt does not work. I am using win2000. Do you get any output with LCDInfo or how it doesn't work ? In the development forum you can check the blinkenlights player and animation player that should work with 128x64 KS0108 displays. Post subject: Got it working. But what about the back light? Inverter? Finally, I was able to verify that the CFAG12864B LCD is working correct. The hardest part of verifying LCD was to find the program that runs on parallel. Some reason, it didn't work (the wiring is correct.) Also I found that CS1 and CS2 are reversed. Changing that wiring fixes swapping image. This wasn't that hard to figure out. While I was wiring it up, I reversed +5V and ground accidently (I hate whenever I do this). I thought I fried the board. Fortunately, CFAG12864B LCD was able to withstand Negative power for a minute. Of course, I have current limiting on external power supply. This brings me a question that does CFAG12864B LCD has internal power supply protection? Now, back light issue. I am using 9V to supply the LCD with 3.9V zener(250mW rating) in series to reduce the voltage to 5.1V. So, I am find with it. What's with Inverter? Why do you need it? Is this back light? According to CFAG12864B specification, they recommand 4.1V with 100mA while hm resister is in series. When I tried this, it did light the back light. This really does consums alot!!!! I am trying to power up with 9V battery. I guess I have run without it. Anyone tried with different voltage and current setting? Inverter is needed if the display has EL backlight. TMI-V has LEDs so there's no need for inverter.